The LCCSA together with the CBA and CLSA have now launched the CHARTER FOR JUSTICE. We hope the charter sets out in a clear way key principles needed to ensure a fair and properly functioning Justice system. The launch of the CHARTER FOR JUSTICE took place at the Law Society is on 26th March, with a panel of speakers chaired by ex LCCSA President Greg Foxsmith. Over 200 people attended and approved the Charter, including representatives from the CLSA, LAPG, Black Solicitors Network, Justice Alliance, the Law Society and more. There was a lively Q and A session, which included a strongly supported call for unified action against the recent AGFS funding proposals. 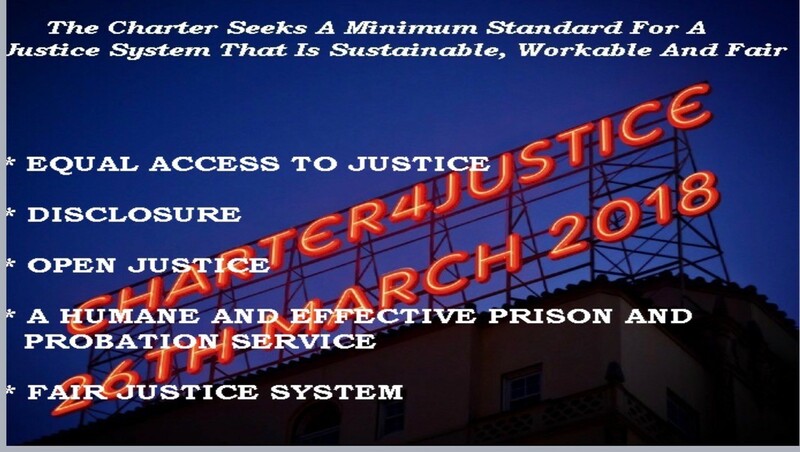 We now have a CHARTER FOR JUSTICE that we can unite behind and campaign for. We invite Justice Organisations, solicitor firms, chambers and individuals to sign the Charter, which we will then present to the Ministry of Justice. Read Tuesday Truth blog by Jon Black here, or Greg Foxsmith’s blog “Why we need a Justice Charter” here. Don’t miss the Blog by Raj Chada here. We would like to thank our panellists above, Sara who organised the venue and bookings, the Law Society for use of the venue, Jon Black who devised the original idea and “tweeted” the event, Jon, Greg F and Rhona for drafting the charter, Stuart Wild for the graphics, CLFS for filming, and all who attended for the launch.